It is being dubbed the new "bullet-proof bra", a new kind of Wonderbra which could help protect thousands of women police officers here in Germany. It may sound like a joke, but this is a serious matter - the policewoman who came up with the idea said normal bras can be dangerous when worn in combination with a bullet-proof vest. "The impact of a bullet can push the metal and plastic bits of the bra into an officer's body, causing serious injury," said Carmen Kibat, an adviser on equal opportunities for the Hamburg-based Bundespolizei - Germany's federal police force. "I always thought normal bras posed a safety risk and I wanted to change that," she said. "These new bras are very important and they will help all our women officers." Dozens of German policewomen have already tested the new bras and, after a two-month long trial, the underwear is being issued to officers as part of their uniform. So what do the new bras look like? Well, looking similar to sports bras, the new bras are white, made from cotton or polyester and padded. They also have the word "Police" printed at the bottom. Crucially, though, the bras do not have any under-wire or fastener made out of metal or plastic. From now on, women police officers will be allowed to pick three bras from a range of designs, varying in size and style. 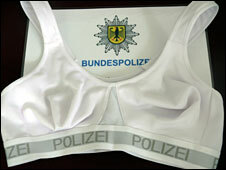 "These new bras represent pioneering work," said Ruediger Carstens, a spokesman for the Bundespolizei. "It shows that the safety of our officers is a top priority." In all, more than 3,000 front-line women police officers across Germany are being encouraged to wear the new bras on duty. So that includes female officers deployed at airports, train stations, or those deployed at border crossings. But at the end of the day, it is up to each individual officer to decide whether she will go for the latest "bullet-proof" lingerie - a police spokesman was keen to point out that the new bras "are optional".